Private Tour and Depart everyday. Pickup from railway station or airport directly to Xilamuren grassland. After crossing the Yinshan main veins-Daqingshan , passing old revolutionary bases-Wuchang County, we will arrived. For lunch, you can taste Mongolian flavor-grasping meat. Both mongolian girls and boys present you with the whith hada. In the afternoon, visit the herdsmen's family and you can understanding the sedentary lifestyle. Enjoy the mongolian flavor milk, milk food. 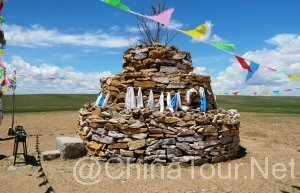 visit the Mongolian festival shrines-Aobao Hill. 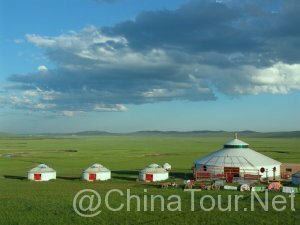 Check in Yurt or return to downtown to check in Zhaojun hotel (3*) or Holiday Inn Hotel (4*) if temperature is below Zero degree at night at the end of October. 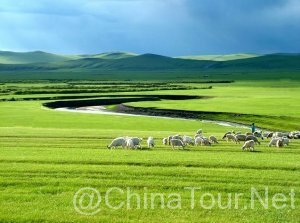 -Xilamuren grassland: Xilamuren, meaning "yellow river" in Mongolian, is located 100 kilometers north of Hohhot. Xilamuren Prairie, commonly known as Taihe, got its name from the Puhui Temple, a Lama temple built in the Qing Dynasty near the Xilamuren River. 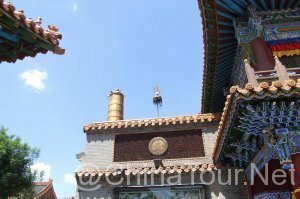 Constructed in 1769 during the reign of Emperor Qianlong, Puhui Temple was initially a resort of the Sixth Panchen Lama of Xilitu of Huhhot. With engraved beams and pictured purlins, the temple appears quite splendid.Xilamuren Prairie, a typical example on the plateau, is covered by green grass and fresh flowers every summer and autumn. Due to the continual investment of the local government, reception service is growing better and better. Thus, Xilamuren has become a popular scenic spot in Inner Mongolia. -Ao Bao: The most common and grand sacrificial activity of the Mongolians is the sacrificing of Aobao. Aobao means heaps of stones. Aobao is normally set up in hills and mountains, it is a cone-shaped solid tower made of stone.A long pole is inserted on the top, fur or animal skin and cloth ribbons are tied on the pole end, rocks for incense are placedaround.Sacrificing of Aobao is mostly held in each June, July and August. When sacrificing, the worshipper will take Hadas,mutton, fermented milk and dairy food to the Aobao. Hadas and sacrifices will be presented firstly and Lamas will chant Buddhist scriptures and the other people will worship on bended knees. Then, they will addstone or wicker to the Aobao and colorful silk strips and Sutra streamers. After the sacrifice, such activities as horse races, wrestling and archery will be held, the event later will develop into a Nadamu meeting. In the morning we visite the beautiful grassland sunrise. 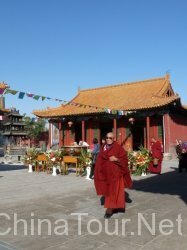 Meanwhile, we also enjoy traditional Mongolian style breakfast, then returne to Hohhot, visite the famous Tibetan Buddhism shrines - Dazhao Monastery and Ancient Suiyuan City General's Mansion. After lunch visit the National Technology Manufactory Inner Mongolia (flight trip will omit this) and then transfer to airport or railway station for your departure flight. 4. 2 persons share a Mongolian yurt with daily breakfast; solo trip: single. 2. Horse back riding on the grassland. 1, Inner Mongolia has extreme weather. There is a dramatic difference in temperature between day and night. It is necessary to take some warm clothing or rent them on the spot when you travel on the grassland. It is also one of the driest regions in China. You are kindly reminded to bring hydrated and take moisturizing lotion to protect your skin. 2. Reservation should be made at least three days before departure time. 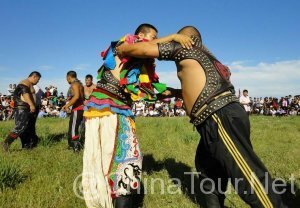 Reply : Hello, Do you want to travel Inner Mongolia on May 2nd? Whats' your plan? Enquiry : s the yurt stay available? If I want to take train from Beijing in which station is the pick up? Reply : hello it is very cold at that time, so the yurt is not avaiable, and the pickup train station is at Huhhot , not beijing train station , if you want pickup service at beijing too, it is 230cny one way. Reply : Thank you for sending email to Chinatour.Net It is price of tour 2017, can you tell us you need 3 star or 4 star or 5 star hotel? I will give you new price per person and tour details. Looking forward to hearing from you.